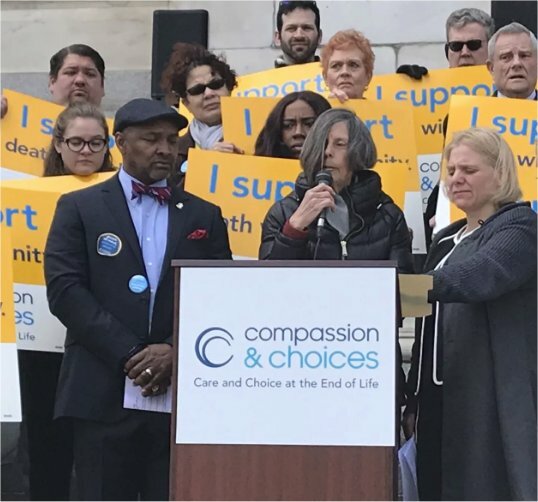 Nearly a year after the District enacted a law allowing terminally ill patients to end their lives — over the objections of congressional Republicans, religious groups and advocates for those with disabilities — not a single patient has used it. And just two of the approximately 11,000 physicians licensed to practice in the District have registered to help patients exercise their rights under the law. Only one hospital has cleared doctors to participate. Mary Klein, a D.C. resident in the final stages of cancer who became the public face of the movement, says she hasn’t been able to find a willing doctor. Officials with the national advocacy group Compassion and Choices blame local health officials for creating what they consider a cumbersome process that dissuades doctors from participating. The bill signed by Mayor Muriel E. Bowser (D) allows patients with less than six months to live to receive a fataldose of drugs after making two requests at least 15 days apart. Two witnesses must attest that the requesting patient was of sound mind, and patients must take the medication without assistance. It was modeled after Oregon’s first-in-the-nation 1998 law. D.C. health officials added requirements when implementing the law, which was approved in late 2016 and took effect in July, including psychological evaluations for patients, registration for doctors and online training for patients and doctors. Advocates fear doctors may not want to end up on a government registry, even though their names aren’t publicly disclosed. “They don’t want to be known as the doctor who gives out death prescriptions,” said Omega Silva, a retired physician in the District and a Compassion and Choices volunteer. The group has been talking to local health officials about revisiting these rules, and D.C. Council members are considering changes. Health officials imposed the requirements in response to concerns that patients could be pressured into an early death. The practice is especially controversial among African Americans, who make up nearly half of the D.C. population, because of a historical distrust of the health-care system. At a hearing before the D.C. Council on Monday, D.C. Health Director LaQuandra Nesbitt said she resented advocates who suggest she was trying to impede the law. She said the department notified all 11,000 licensed physicians that the law was in place, and suggested aid-in-dying advocates should have done more outreach to the medical community. Before the law was passed, the city estimated that 10 people a year would exercise its provisions. Compassion and Choices says 11 people have called its hotline about using the law. But there doesn’t seem to be much interest from doctors. No local practicing physician testified in favor of the measure, and several opposed it, during debate before the D.C. Council. The practice was also slow to take root in the six other states that allow it. (Hawaii will become the seventh after the governor signed an assisted-suicide law this week.) The first publicly known death from the assisted-suicide law in Vermont, home to fewer people than the District, happened nearly 18 months after the law took effect. “It’s just going to be a slow process to adapt to a new way of thinking,” said Peg Sandeen, executive director of the Death With Dignity National Center. In the District, Sibley Memorial Hospital is the only hospital to publicly say its doctors may participate. MedStar Georgetown and Providence, which are affiliated with the Catholic Church, oppose it. Kaiser Permanente and the rest of the MedStar network are crafting policies for their doctors, representatives said. Howard University Hospital has no policy, and representatives of George Washington University Hospital and the city-owned United Medical Center did not respond to requests for comment. Advocates suspect that physicians may have been reluctant to register because they expected interference from Congress, which can overturn D.C. laws and dictate the city’s spending. An attempt to overturn the law failed last year. President Trump’s budget proposal blocked the District from spending money to implement the law, but the provision didn’t end up in the final budget. Last week, Klein, the cancer patient and advocate for the law, and more than a dozen volunteers lobbied city officials to launch an education campaign and ease barriers to access. After a three-and-a-half-year battle with ovarian cancer, Klein is preparing to begin hospice treatment. A 70-year-old former journalist, Klein wants the option to use life-ending drugs if she’s facing intense pain. One of her doctors didn’t want to discuss the matter, she said. Another seemed skeptical. Klein said she briefly considered traveling to a country where she could more easily end her life.